Talk About Your High-Risk Pregnancy! 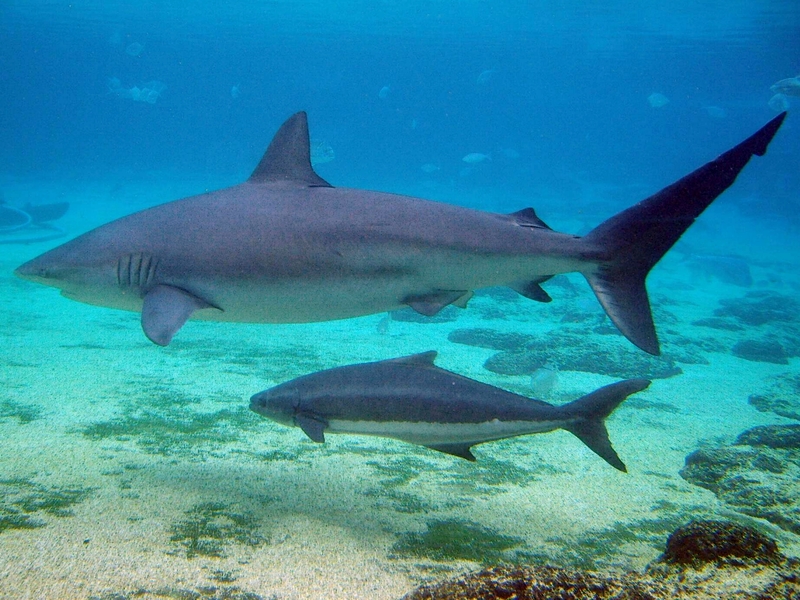 Could Hawaii Scientists Use Shark Sonograms? Here in Hawaii, we know a lot about many of the sea creatures that inhabit our islands’ waters. But, sharks? Well, it can be pretty hard to get up close and personal with a living shark — you probably know why! In fact, used to be, when a scientist wanted to examine a pregnant shark, he had to kill the shark first in order to avoid being attacked. But, there’s some big news out of Miami: scientists there have developed a way to examine pregnant tiger sharks by using an underwater ultrasound, much like the ultrasound used on pregnant women. According to the Miami Herald, University of Miami scientist Neil Hammerschlag first noticed an over-abundance of females in a diving spot called West End and wondered why few, if any, males were present. Hammerschlag thought the differential may have something to do with reproduction. But, he ran into a problem. To find out, he would have to kill and cut-open some of the female sharks. And, that didn’t seem right. So, instead he and co-author James Sulikowsky, of the University of New England, got to thinking about over-the-counter pregnancy tests and the way humans confirm pregnancies, the newspaper reports. Do not enter the water if you have open wounds or are bleeding in any way. Sharks can detect blood and body fluids in extremely small concentrations. According to the Miami Herald, the scientists started using portable, waterproof shark sonograms developed for animal husbandry to make the job easier. The shark sonograms are lightweight, easy to maneuver and come with goggles, rather than a screen, to view images. By using the new devices, scientists can take advantage of the tiger sharks’ 16-month gestation period and learn more about their reproductive cycles. The newspaper described how the device works: First the team baited lines attached to a secure floating drum, which they checked every hour. Once hooked, the team reeled in the sharks, using their 66-foot research boat to back down on the fish in a kind of tug-of-war that evened the playing field, since the sharks are big enough to pull an angler overboard. Once close enough to the boat, a team member would lasso the shark’s tail and pull it out of the water. Other members then wrestled it aboard a submerged platform and inserted a 3-inch PVC pipe into its mouth to pump oxygenated saltwater over the shark’s gills. In addition to the sonogram, researchers also drew blood to measure hormone levels. Total exam time: about 20 minutes. Shark adventure companies, like North Shore Shark Adventures, believe in preserving and understanding sharks, and the new technology will hopefully allow more people to understand them and stay safe. Considering Hawaii has an abundance of tiger sharks in its surrounding waters, you can bet Hawaii researchers will soon want to take advantage of this underwater technology, too. And, it could help preserve and understand our own population of tiger sharks here in the islands, a goal shared by many local shark adventure companies, including North Shore Shark Adventures. And, the more we learn about shark reproduction, the more we can do to understand exactly where pregnant females hunt, which in turn, could help keep swimmers safe.